2017 saw a dramatic increase in the number of users of Performance Canvas Financials – a complete, modern, and unified solution for reporting & analysis, budgeting & planning, forecasting, and financial consolidation. While many CFOs have joined the bandwagon on investing in Performance Canvas Financials in order to streamline and automate their entire budgeting process, we continue to be in conversations with many CFOs that are patiently waiting and assessing whether this tool is the perfect fit for their organization or not. If you or your finance department is looking for a budgeting and reporting solution that will introduce drastic improvements in the way you work then perhaps this article will help you in your decision-making. Below are 8 common misconceptions about Performance Canvas and its corresponding clarification or explanation. Hope you find it useful. 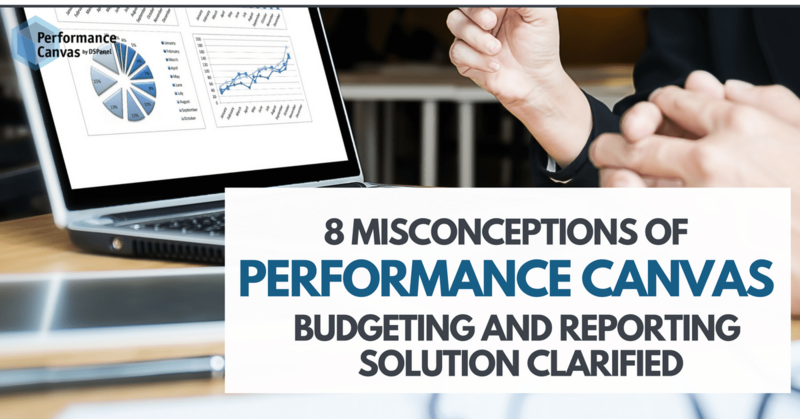 When Performance Canvas Financials was created, the goal was always to give the power of using and maintaining the solution back to the finance department so they won´t have to rely on the overworked IT department which can cause expensive delays. Contrary to the misconception that it is hard to install and maintain, this solution despite being robust and using a powerful database, requires only 4 hours for the actual installation with minimal involvement from the IT team. Once, it is up and running, it is also easily maintained and its maintenance can be done by the finance users themselves. Performance Canvas Financials works by giving its users off-the-shelf modules in order to for the solution to create value faster for the finance department. These modules contain the latest best practices in various industries when it comes to reporting and analysis, budgeting and planning, forecasting, financial consolidation, scorecarding and dashboarding or metrics management. That said, during deployment, the unique setup of the business is configured in the solution to ensure that the platform makes sense to the organization. Aside from it is highly configurable, one is never just limited to the purchased modules because the upgrade possibilities of this tool is endless. You can add more system integrations, AR/AP automation, profitability analysis, sales, project portfolio management, and many more. Excel spreadsheets, while it delivers, are notoriously known for being error-prone and problematic. This is a fact taken into consideration when Performance Canvas Financials was built from scratch. This is also precisely why Excel serves only as a window to the solution. All the numbers, rules or formula are at the backend to ensure that Excel does not get overloaded affecting its performance. Simply put, Excel in this solution is used as an interactive screen where you can view your figures. What Performance Canvas has done is that it offers its users the ability to do both excel modeling and server modeling while making sure that none of the earlier known issues such as versioning, security, slow performance, etc. exist. Performance Canvas Financials, on the other hand, has significantly minimized the risks by putting in multiple layers of security. There is security on the cells themselves or the workbook, there are role-based security restrictions, and there is database security. In terms of security, users can be guaranteed, there is no going around it. Performance Canvas Financials is a solution built by finance experts for the finance department. This is the very reason why from start to end of deployment, the involvement of IT is minimal. IT department or staff is needed only during the 4-hour installation and the testing afterwards. The bulk of the work is done together with the finance department because they are the ones that understand how the organization and processes work so all organizational and account mappings are done with them. After all, this is a solution for them. Performance Canvas Financials works with Salesforce and any other CRM system that our Excel load, web services or ,SQL server can reach. Therefore, sales budgeting or sales forecasting is easily supported by this solution. One of Performance Canvas Financials´ strength is its seamless integration with ERP systems like Epicor ERP, iScala, Enterprise, SAP, Oracle Financials, MS NAV, MS AX, and GP among others. On top of that, Performance Canvas Financials can also integrate with any existing line of business system an organization already has. Performance Canvas offers the same world-class planning and reporting capabilities as the established brands in the market (because they were developed by the same developers) but for a fraction of the price. Aside from being more value-for-money for on-premise deployments, Performance Canvas also boasts of being one of the most reasonably priced SaaS subscriptions in the market. Have a question that this article didn´t answer? Need a demo of the product? Email info@dspanel.com or visit www.performancecanvas.com today.